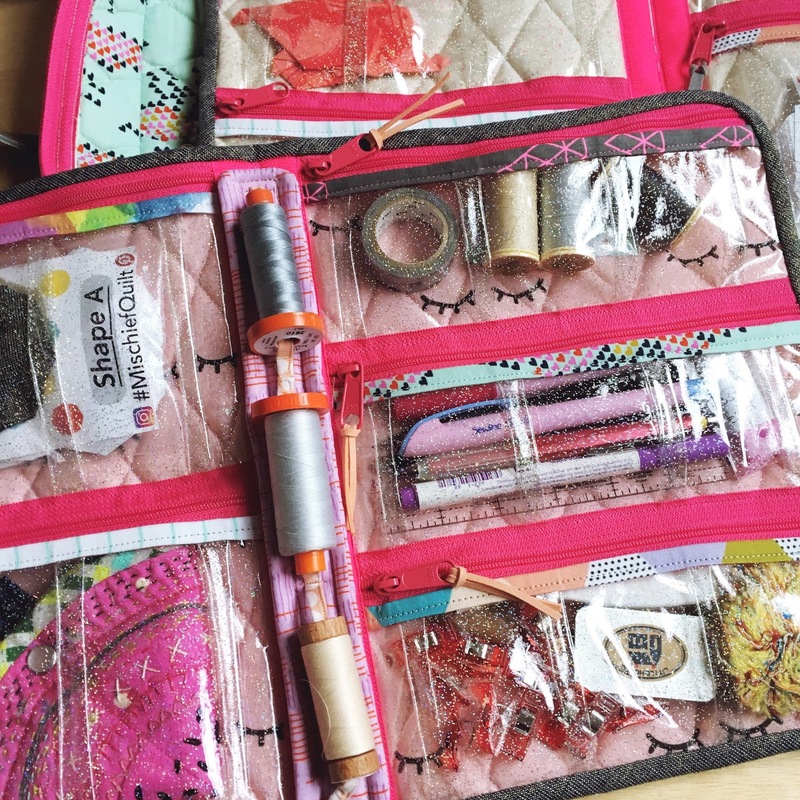 Every year in August, my daughter Marianne asks me to make her a new pencil case for school. This year, she starts university (to say I'm proud of my McGill University student would be the understatement of the year!) so she needed a "serious" looking case. She needed something big enough to accommodate a big scientific calculator and I wanted it to be a pretty quick finish so I used this tutorial once again. I used it recently to make myself a travel zipper pouch. The dark pink print is from Connecting Threads and the pink solid is Kona Flamingo. I only had 1 zipper that was long enough and would fit with the pink so I had to settle for a white zipper. I just love those pink zipper tabs! The lining is a print I've had in my stash for a long time. 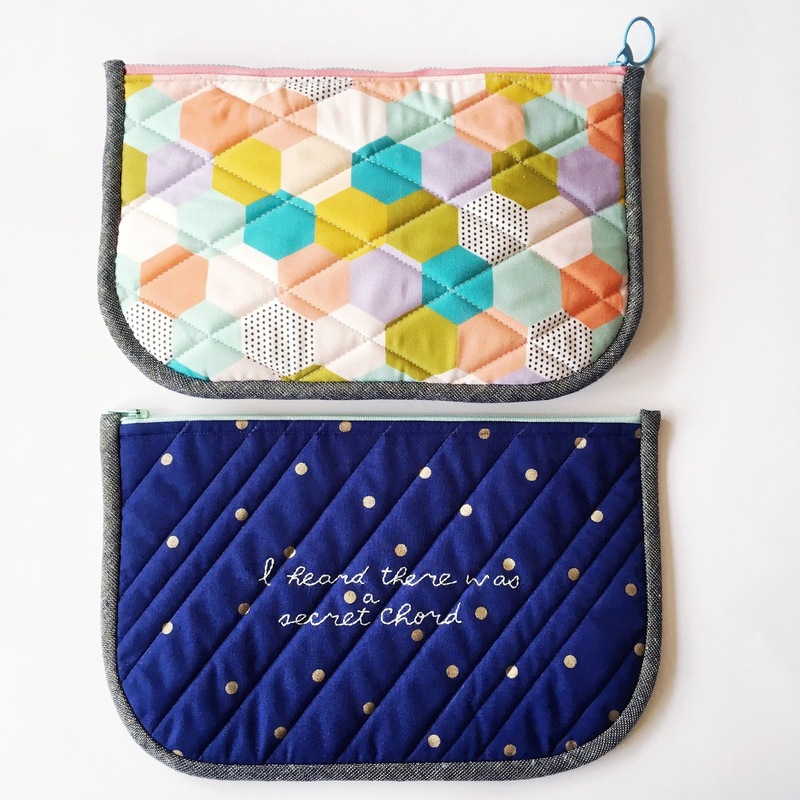 Marianne loved her new zipper pouch and I'm actually disappointed I didn't make one identical to hers for myself! 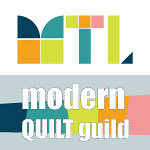 I will be linking up this fun little finish at Anja Quilts for TGIFF! I'm on vacation!! Not been doing anything special really, just relaxing and enjoying the sunshine. Fall will be here before we know it after all so I need to soak up those rays while I can. 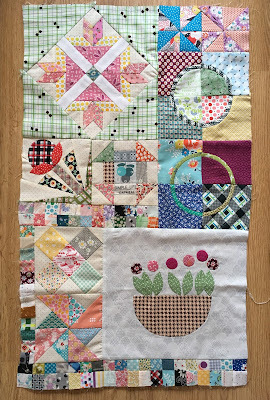 I've been doing a little bit of quilting in the evening and this week, I was flipping through an old issue of Modern Quilts Unlimited (Summer 2013) and saw a small wall hanging designed by a fellow member of the Montreal MQG - Josee Carrier who blogs at The Charming Needle. Josee's designs are always really crisp and clean and very modern - I just love her style. I knew I had all I needed in my sewing room so got started right away. I used a bunch of different Kona cottons, including Ash and Charcoal for the background and binding. I did have difficulties keeping the 1" strips straight, but I'm pretty happy with the results. For the quilting, I used my FMQ foot to quilt spirals in different sizes. I really like the texture of this quilting and the contrast with the very graphic design. This was my first time doing a matched binding and I have to say - it worked out pretty well. I'll be linking up at A Quarter Inch from the Edge for TGIFF. A little while ago, I signed up for Quiet Play's newsletter and got a free pattern as a little Thank You! I had seen these all over Instagram - how cute is that?! I'm not usually a big fan of paper piecing and there are some really tiny pieces in this block (the whole block finishes at 10"), but I just had to make this one. It took a few evenings to get this sewn up - I got really close to my seam ripper in the process - but I'm really happy with it. For the quilting, I went with fun wavy lines with the walking foot. Hello! 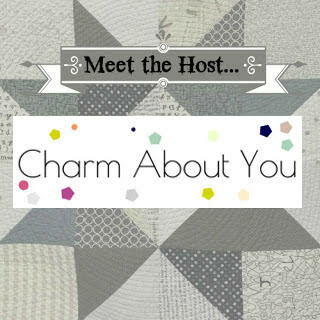 I am Lucy, Charm About You blogger and one of the Finish-A-Long hosts, here to share a little more about myself. I come from a creative family, everyone is an artist or crafty type - whether it's by profession or a hobby. My creativity and love of art was encouraged as I was growing up but it wasn't until I was at university when I made my first quilt. It was really, really bad. I used the type of wadding meant for furniture, it was nearly impossible to quilt and it put me off for a long time. Fast forward and after breaking my elbow in a roller derby accident, with two small children to look after at home, I needed a safer hobby and I returned to quilting. 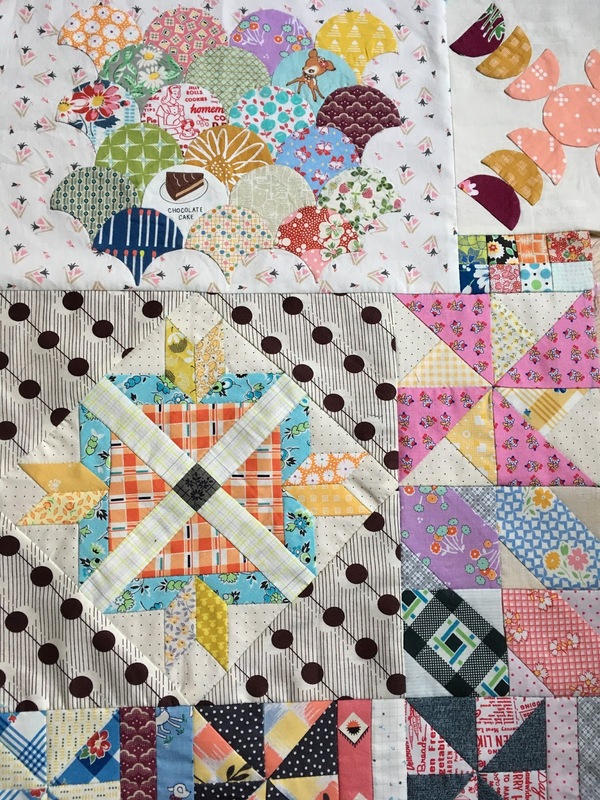 Eager to learn, I got some great advice and support from the two women in my family that quilt, I read lots of blogs, tutorials and quilt books and then went for it. 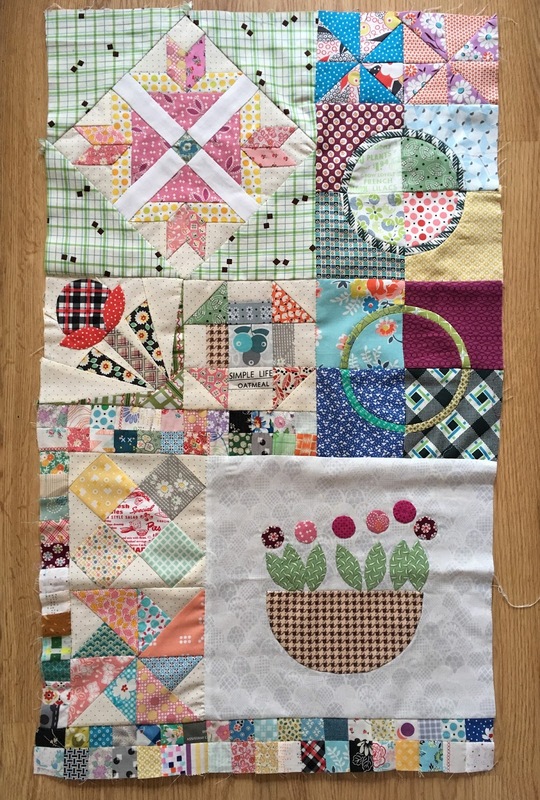 I made simple quilts and a sampler quilt, building up my skills trying out new patterns and techniques. The addiction gripped me and the more quilts I made the more I discovered which elements I was good at, enjoyed and wanted to do more of! I live in Manchester, UK with my husband and our three kids. They are wonderfully supportive of me and put up with the piles of fabric and works in progress that have filled the house. During the evening I love to do hand sewing, whether that be English Paper Piecing, hand piecing or quilting. It's my time to relax and I find it really hard to sit without sewing now! I was lucky enough to get a job at Patchfinders, a local quilt shop, where I also began teach quilting classes (and still do!). It was brilliant to be able to 'talk fabric' with so many people - I learnt a lot about style, colour, print etc. from being in the shop and witnessing the whole process of how people chose fabrics for their quilts. The same sort of inspiration and delightful insight into creativity comes from the people in my classes and is one of the many reasons I enjoy teaching. 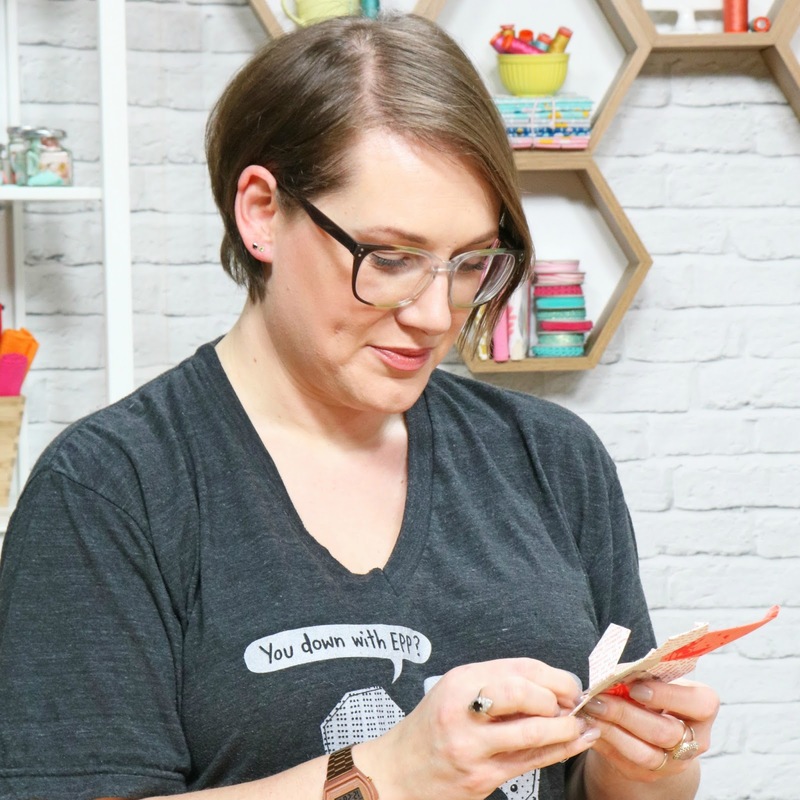 Then this year I also started doing demonstrations on the Sewing Quarter shopping channel. 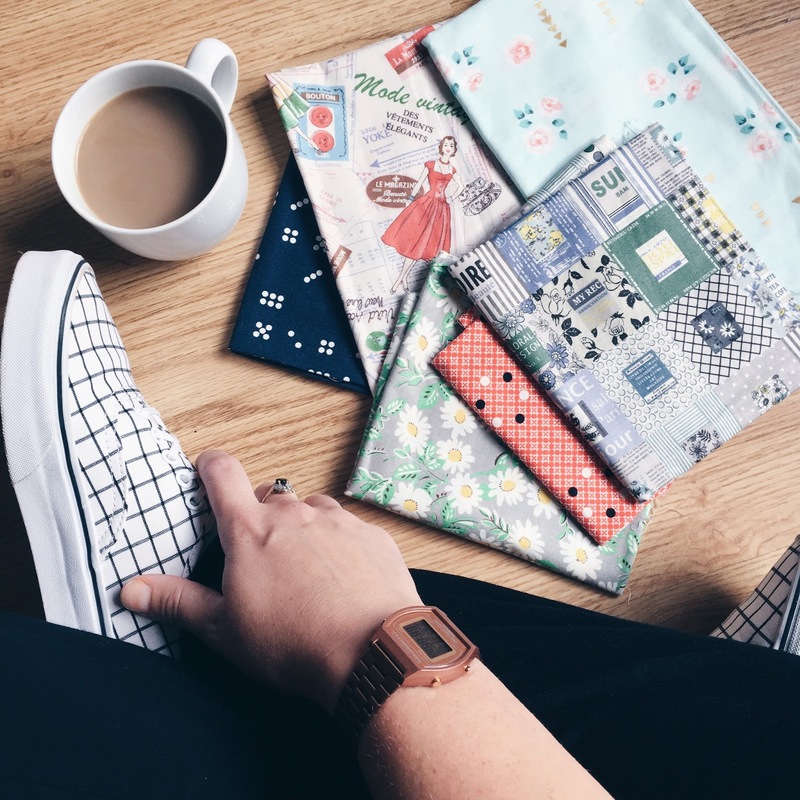 It involves travelling to work and train journeys equal sewing time! One of my recent finishes was the Everything In It's Place Bag, which I wanted to make to hold all the sewing 'stuff' I can't live without. It feels so good having my supplies with me and there's such a buzz that comes with using handmade. 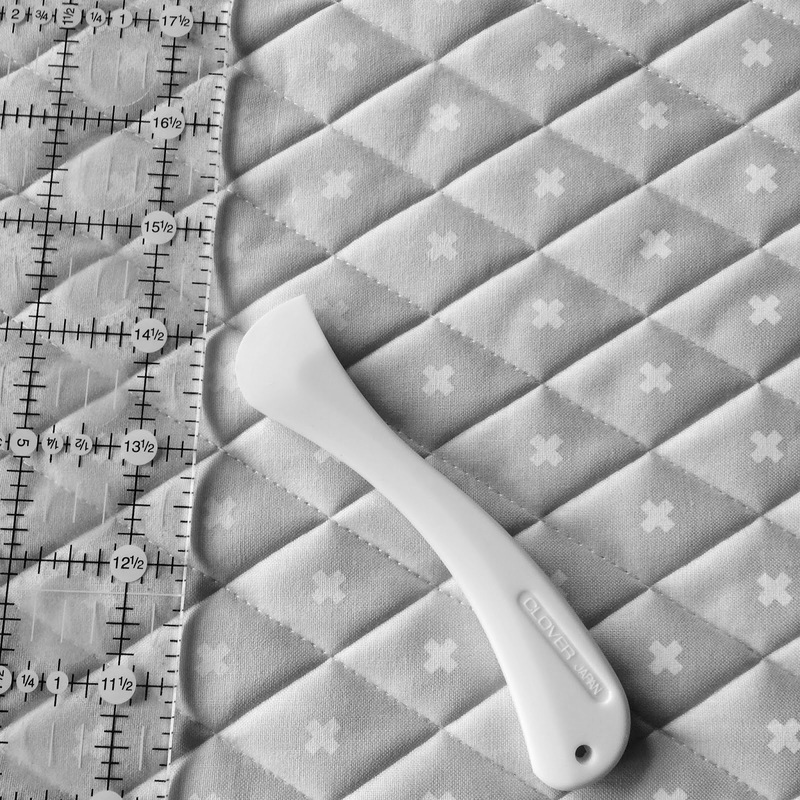 The tangible products we create, the snuggly comfort of quilts and the fact that they are enjoyed and used is a big part of the joy of making. 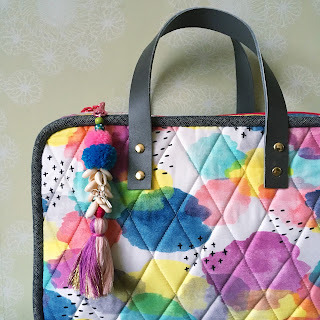 I am also drawn to all the possibilities of patchwork and quilting, the various techniques you can use, the choice of fabric - prints / solids / colours and all the patterns. 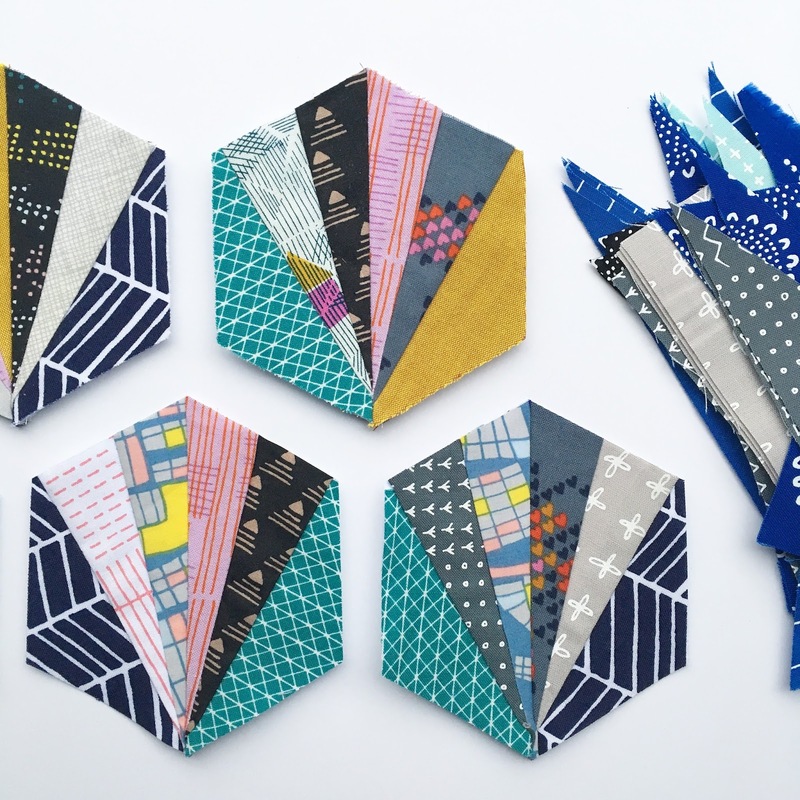 Machine sewing is my choice for quick sews, the precision of foundation paper piecing and meditative chain piecing. More recently I have had to hone my skills at machine binding because I just don't have the time to hand sew binding on the quilts I make for work. 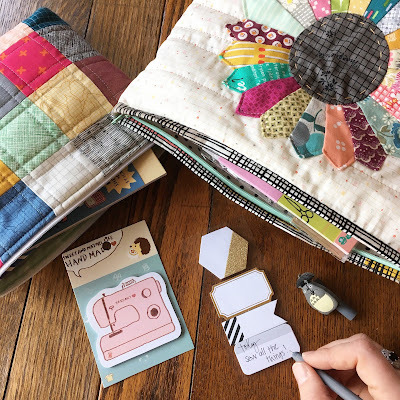 Hand sewing would generally be my preference for patchwork and quilting, though I really love being able to switch between the two and do machine sewing when I have that need for speed. Having insatiably explored various patchwork and quilting methods I share tutorials and tips on my blog, from cross hatch quilting to cleaning your cutting mat; free patterns and fun things to make. Visit my Etsy shop for patterns like the popular Stitchy Pie needle case and my most recent A Piece of Me pouch. Later this year I will be adding quilt patterns too, all being well! 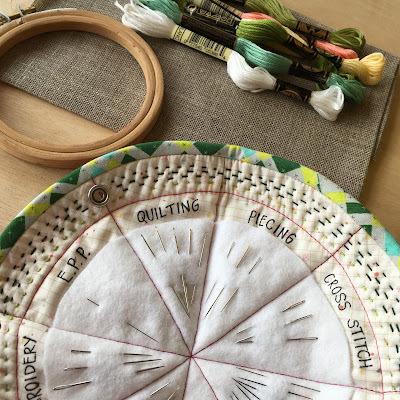 I have a 'to sew' list, along with a notebook of design ideas - making them into patterns is my intention and my goal for the next few months is to make time to do that. I would love for you to come and visit me at Charm About You or jump over to Instagram and follow me there, I share all my finishes and everything I'm working on. 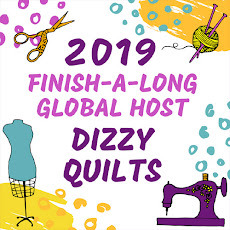 So how is everyone getting on with their Finish-A-Long list? Any finishes checked off yet? If not, don't fret - there's still about 7 weeks before the link opens... just remember that time flies when you don't stick to one project!